Then simply click the player and a dialog box will open from where you can select a video from your computer (if a box does not open, then click the blue Replace Video button to open it). The editor supports M4V, MPG, MOV, WMV and most other standard video formats. Once the video is uploaded, we then have to encode it. The element itself will display the amount of time remaining in the encoding process. 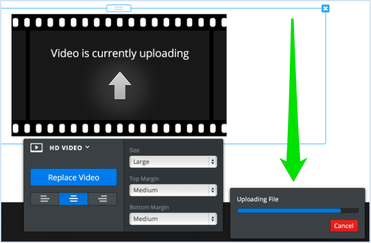 While the video encodes you can continue to work on other pages and content for your site (no need to kick back and relax during encoding), and when you come back later the video will be encoded and waiting for you. Once the encoding process is complete you'll be all set and your video is ready to watch. You can upload an unlimited number of videos to your site. The only limit is that no single video can be larger than 1 GB by itself. Which means you can't upload any 1.5 GB videos to your site, but can upload as many 950 MB videos as you want.